In April this year, I visited southern Italy. I took two organized tours with Andante Travels, a small British company that caters for travellers with an interest in ancient history. Each tour was led by an academic in archeology, and with a tour manager who was also an archeologist. The first tour was of ‘Sicilia Antiqua’. Early April proved to be an excellent time to visit Sicily, the weather fine and cool enough for walking through the extensive archeological sites, which were all covered with masses of wild flowers. Throughout its history, Sicily has been invaded and occupied by a succession of different peoples and cultures. From about the 8th century BCE, both Greeks and the Phoenicians established major cities there. 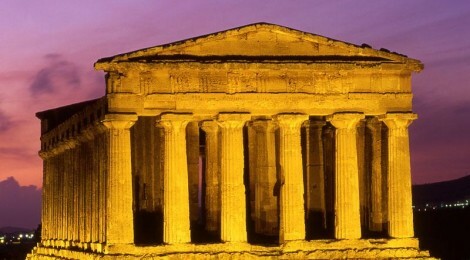 As a result, Sicily (Trinacria to the ancient Greeks) is home to some of the best preserved Greek temples in the world. We saw many during our tour. Selinunte is home to 5 temples, and Agrigento has 7. Apparently you could never do too much to placate the gods, in those days. The Temple of Concordia at Agrigento was reused as a Christian church, archways being cut out of the solid temple walls. Another ‘recycled’ Greek temple, is the cathedral at Syracuse, where the original Greek columns can be seen, incorporated in the cathedral walls. Most of these temples are huge. To explain how the columns were made, we were taken to ancient quarries at Cava di Cusa, and shown unfinished column drums, cut by slaves out of the rock using chisels. Many were lying abandoned on the ground; others had never been detached from the bedrock. An afternoon was spent at Segesta, seeing its ancient theatre as well as its picturesque and much-photographed ‘temple’ amid rolling hills. In fact, the Segestans erected only the surrounding peristyle of columns, and did not even begin the temple itself. As our guide explained, in accordance with ancient Greek practice, the temple itself would have been a windowless building inside the rectangle of columns. It would have housed a statue of the god, and possibly the city’s treasure, and few people would have been allowed to enter. Actual worship would take place outside, at a sacrificial altar in front of the temple. The unfinished temple may have played an important role in history, however. In 416 BCE, Segesta was at war with the neighbouring city of Selinunte. Selinunte called on its powerful ally, Dionysius I, Tyrant of Syracuse. Segesta appealed to Athens for help but, before agreeing, Athens wanted assurances that Segesta was rich enough to contribute to the expenses of the war. The story goes that the Segestans showed the Athenian ambassadors the city’s gold plate, implying (falsely) that there was a lot more where that came from. They may also have pointed out – from a distance – the beautiful, and huge, ‘temple’ on a hill. Only a very prosperous city could afford a temple of that size. Satisfied, Athens entered the war and sent a huge force to attack Syracuse, only to find that Segesta had no funds. The Athenian forces were defeated at Syracuse, and it has been argued that this defeat was the beginning of the end for the Athenian empire. We visited the quarries near Syracuse, where thousands of captured Athenian troops were held as slaves. Another visit was to the massive fort of Euryalus, overlooking Syracuse, built by Dionysius I after the war with Athens, to overcome a weak point in its defences. Completely ‘state of the art’, the fort was never taken by an enemy, even when Syracuse fell to the Romans nearly 200 years later. Less remains of the Phoenician settlements of Sicily than of the Greek. We went to the island of Motya, a thriving Phoenician city and naval base for Carthage. It was destroyed, and its inhabitants mostly massacred, by the forces of Dionysius I in 397 BCE. Our sympathy for the Phoenicians was somewhat tempered when we visited the Tophet, the sacred depository for urns containing the remains of babies, most probably sacrificed to the Motyans’ deities, Tanit and Baal. In the 3rd century BCE, Sicily was incorporated into the Roman empire. At Piazza Armerina there are the remains of a large country estate of the late 3rd or early 4th century AD, including the Villa Romana del Casale. It is most famous for its mosaics. They are described by the UNESCO world heritage committee as the finest mosaics in situ anywhere in the Roman world, and it is easy to believe. They can be viewed from walkways above floor level which snake through the villa. Naturally, we also visited the ancient theatre in Taormina, perched on a cliff above the sea, with Mt Etna in the background. Most of the remains are of Roman construction, but sit on top of an earlier Greek theatre. With the decline of the western Roman empire, Sicily was briefly under the control of Vandals and Ostragoths, but then became part of the eastern, Byzantine, empire. In the 9th century AD came the Arabs, who left an enduring mark on the architecture, dialect, music, agriculture and cuisine. Then in the 11th century, one of the Arab rulers, in a dispute with his own father-in-law, invited help from the Normans who had established themselves in southern Italy. The Normans invaded, and then made themselves rulers. Palermo was captured in 1072 by Count Roger I, and became the capital of Norman Sicily. 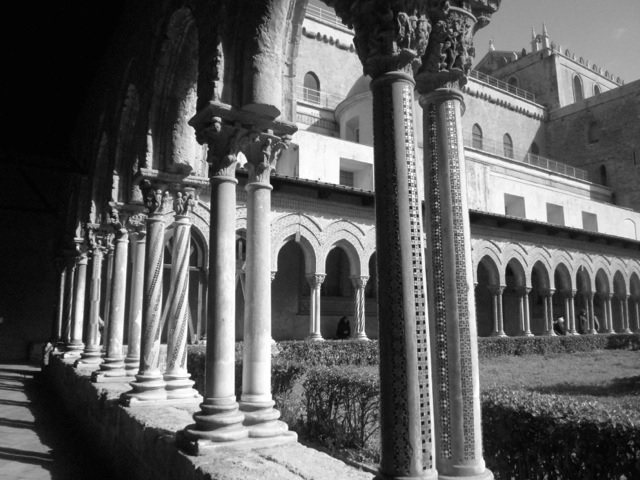 The Normans adapted themselves to the Arab culture, finding the idea of a royal harem particularly acceptable. (This is reflected in one of Boccaccio’s stories in the Decameron). 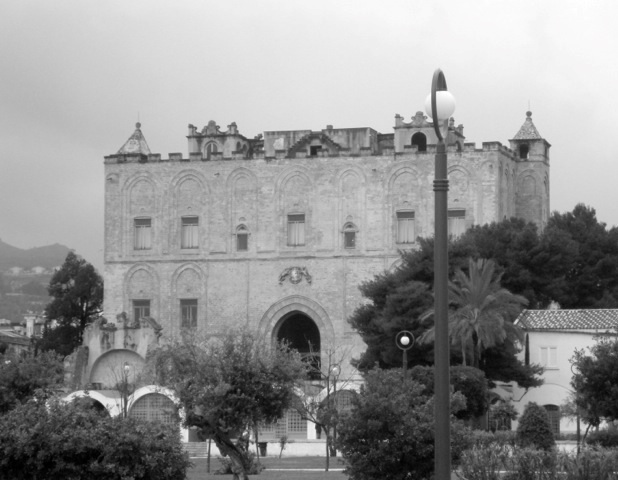 The Normans enjoyed Arab-inspired luxury in ‘pleasure palaces’, including the recently restored “La Zisa” on the outskirts of Palermo, which we visited. Norman rule lasted not much more than a century. But it left behind glorious art works, especially glowing golden mosaics, depicting Christ Pantocrator, the Madonna and saints, and Bible stories, probably made by Byzantine craftsmen. They can been seen, very well preserved, in the Cappella Palatina of the Royal Palace and in the Martorana church in Palermo, at the cathedral in the medieval town of Cefalu, and most famously at the cathedral and abbey of Monreale. 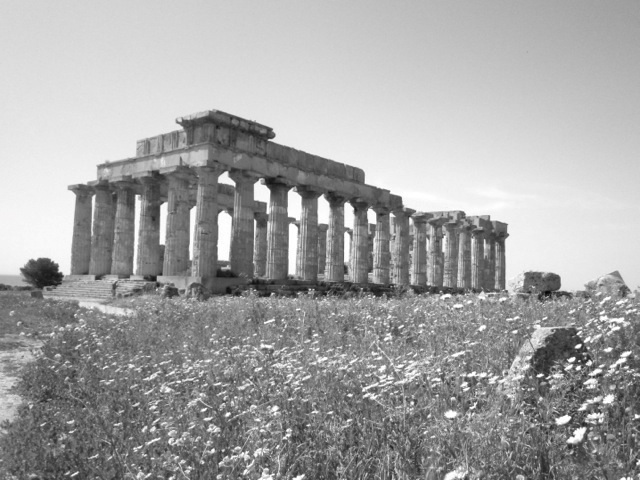 The vicissitudes of Sicilian history continued for many more centuries, of course. When I was staying in Palermo before the start of the tour of ‘Sicilia Antiqua’, I saw many examples of Sicilian Renaissance and baroque ranging from the exquisite (sculptures of Serpotta, Laurana and Gagini) to the (to my eyes) grotesquely over-the-top. But this was beyond the scope of our guided tour of ‘Sicilia Antiqua’, and I had to head to Naples before my tour of ‘Pompeii, Herculaneum and Classical Campania’. I suppose I’ll just have to go back to Sicily again. It will not be a hardship.